When developing a WordPress theme it's often a good idea to make it adaptable to multiple locales, and sometimes it's a requirement to do so. Thankfully, WordPress provides us with a good built-in i18n and l10n gettext system. In this part of our WordPress i18n series, we'll explore how to start localizing a WordPress theme, learning the gettext system along the way. 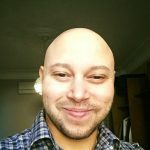 Let’s talk WordPress theme development and i18n. We’ll start building out our custom theme for our clients, Najla and Taha. In part 1 we built theme a prototype of a catalog website for their North African handmade crafts business, Handmade’s Tale. Our clients liked what they saw but felt that the site looked a bit too generic for their taste. 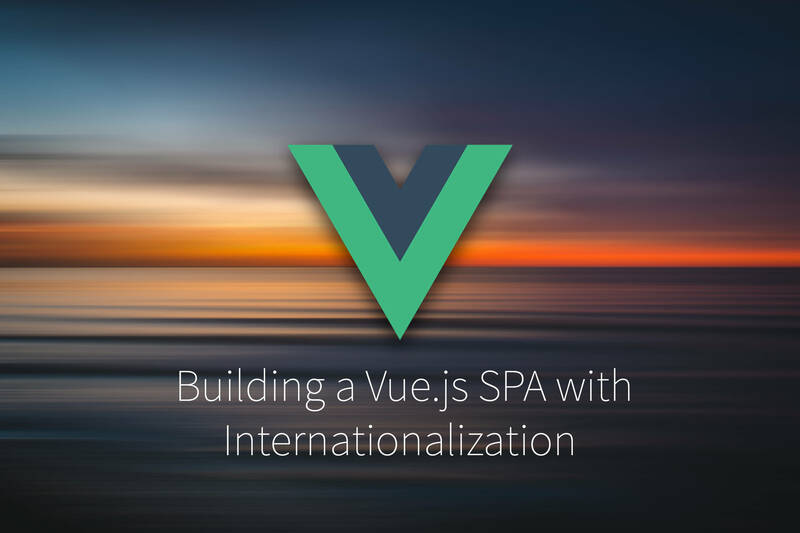 They wanted a simple, custom theme to better reflect their brand, and they wanted to make sure that things still work in the languages their international customers read. Note » You don’t need to have read part 1 to follow along with this one. 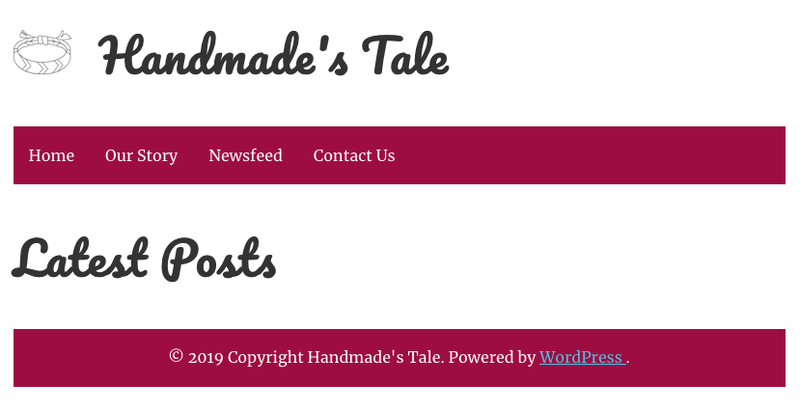 However, if you want to learn how to localize WordPress content like pages, posts, and contact forms, part 1 is a good read. So in this article, we’ll cover the following aspects of building a localized, custom WordPress theme. Note » I assume you have basic knowledge of WordPress theme coding, including file structure, PHP, basic WordPress functions, and HTML. We’ll go into gettext in depth and list the majority of the WordPress localization PHP functions. So we won’t be writing a lot of code in this part, but we’ll build a solid understanding of WordPress i18n, which is necessary to get started with WordPress theme localization. It also sets us up to flesh our theme out more in the next part of this series. For now, we just want to set up the foundations of our theme, so our design will be quite simple. Let’s get started. Here’s what we had installed in part 1. Note » since part 1, WordPress and some plugins have been updated. The updates are minor releases and point releases and shouldn’t have any effect on our work in this series to date. However, do note the new version numbers if you’re building along with us. Note » We’ll also use the WordPress CLI (2.1.0) in this part in order to work with translation files. This will be optional, but we thought we’d let you know in case you want to install everything at once. 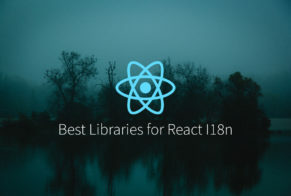 The Polylang plugin is handling a lot of the i18n work for us and therefore deserves special mention. We’ll be relying on the localization features that Polylang gives us as we build our theme. If you’re not familiar with the basics of Polylang, you may want to check out part 1 of this series where we cover Polylang usage in detail. We’ll have a basic WordPress theme directory structure. Most of the following should be familiar to you. 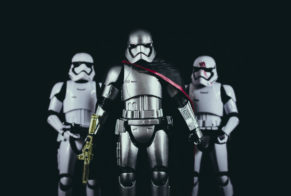 If not, come along for the ride anyway, and check out this article’s companion Gitbhub repo to see how the files will start working together. Note » We’ll flesh out much of the above files in the next part in this series. We’ll lay the foundations to build on in this article. and footer of our index into header.php and footer.php files respectively. You’ll want to put in your own author info in style.css of course. So far we have a pretty straight-forward index.php file. Now let’s start at the top and take a look at our included header. There shouldn’t be anything too unfamiliar to you in this header.php. However, there are some localization considerations here, so let’s take a look at them. Note » We’ll get to the included stylesheet-links partial in an upcoming part in this series. In the second line of header.php we call WordPress’ language_attributes() function. This function will basically echo out the following. When we add these attributes to our opening <html> tag, we let the browser know the language of the content and its direction. Most modern browsers will respect these attributes and attempt to do their best to render the page with respect to our given localization. In header.php above we use the bloginfo() function supplied by WordPress to echo out our site’s character set, name, and description in our <meta> and <title> tags. By using bloginfo() instead of hard-coding these values, we tap into Polylang’s translated site name and description (“tagline”), which we translated in part 1. This means bloginfo() will echo out our Arabic site name and description when the current locale is Arabic, for example. 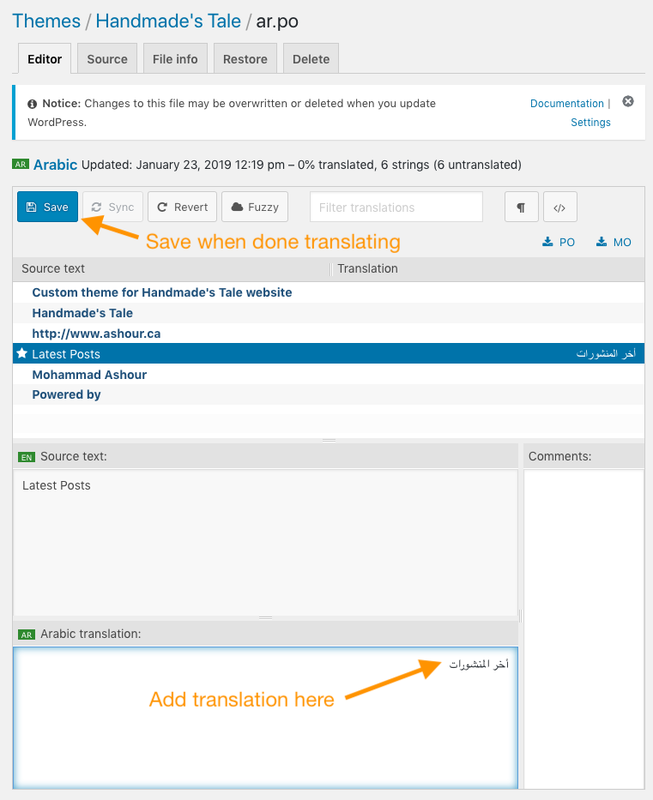 Note » As a reminder, the name and description (“tagline”) were localized in Polylang’s Languages > String Translations section of the WordPress admin. We can simply use WordPress’ home_url() function to get the home page URL for the current locale: WordPress and Polylang will take care of the details for us. Note » The localized URLs produced by home_url() will depend on the specific configuration you set in Polylang’s Languages > Settings section of the WordPress admin. If we wanted to explicitly specify the locale of the home page URL, we could use Polylang’s pll_home_url() function, which takes a language code parameter. So the following will always return the French version of the site’s home page URL, regardless of the current locale. the WordPress admin after you enable your custom theme. Let’s take a quick look at our footer.php file to round out our scaffolding. Notice the __() function here. Instead of hard-coding the string 'Powered by' in our theme, we wrap it in __(). This function is part of a family of WordPress PHP functions that we use to register and display translatable strings. We need to use one of these functions whenever we have a string in our theme that could be localized. WordPress, and the i18n/l10n functions it provides, use a common localization technology called gettext. Wand we should have a basic understanding of gettext to work with WordPress theme development localization. Note » Don’t confuse WordPress’ __() with PHP’s built-in _(). When developing WordPress themes and plugins, you’ll want to use the WordPress localization functions. Our code files are scanned by a program that looks for gettext function calls. When developing for WordPress, these would be the __() function and its ilk (see below for a more complete list of functions). The program generates a POT (Portable Object Template) file, which lists strings registered in gettext calls and serves as a master template for localizations. Each supported locale gets its own PO (Portable Object) file derived from the POT master template, e.g. ar.po would be the Arabic PO file. Each PO file is populated by translators who add a localized version of each string in the file (although a PO file does not to be translated 100% for the system to work). Translated PO files are then compiled, each to an MO (Machine Object) file, e.g. ar.mo would be the compiled result of ar.po. MO files are optimized for performant runtime usage. At runtime the environment locale is set. The gettext system loads the MO file corresponding to the environment locale, and returns its translated strings when a gettext function is called. Note » At runtime, if no file exists for the active locale, or if no translation exists for a give string, the function will return the string it was passed as-is, e.g. __('Powered by') will return 'Powered by' if no translation is found for the string in the active locale. Many major programming languages have built-in gettext support. PHP, which WordPress is built with of course, is no exception. However, WordPress seems to largely use its own from-scratch gettext implementation and provides us with PHP functions that tap into its gettext system. Let’s take a look at how to work with POT, PO, and MO files in WordPress. We’ll look at WordPress’ i18n PHP functions a bit later. The first thing we have to do is create a POT file for our theme. We can do this with the WordPress Command Line Interface (CLI). Assuming we have the WordPress CLI installed, we can run the following command from our within our theme’s root directory in the terminal to generate a POT file. $ wp i18n make-pot . This command will scan the current (theme root) director and generate a POT file with the same name as our theme’s directory. We can also use the Loco Translate plugin we installed in part 1 to generate the POT file. After we navigate to Loco Translate > Home in the admin panel we should see our theme’s name appear under the Active Theme section of the screen. Once we click the theme’s name, we should get our theme’s home screen on Loco Translate. If we haven’t created a POT file for our theme before, a Create template button should be present. Clicking the Create template button will take us to the New translations template creation screen. All we have to do here is click the new Create template button and Loco Translate will create our theme’s POT file. Note » You can use Poedit to work with POT, PO, and MO files if you prefer a desktop app with a user interface or if you have any issues with the other listed methods. The Loco Translate plugin allows for PO and MO file creation and has even a built-in UI for translators to update a locale’s PO files. To create a PO file, we first must have a POT file (we created one using Loco Translate above). Once that is in place, we can navigate to Loco Translate > Home and select our theme. We can then click on the New language button. This will take us to the Initializing new translations screen. First we need to select the language we want to localize for and choose the location for the PO file. As we’re authoring the theme, we can select the Author option for the file location which will store the file under our theme directory. This will make it easier to install the theme along with its localizations should we want to do so in the future. When we’re ready to create the PO file we can click Start translating. We can repeat this process for any locale we want to create a PO file for. We can now begin translating and saving our MO file within Loco translate. The plugin makes this quite simple. We simply open the screen for the locale we want to translate by navigating to Loco Translate > [Theme Name] > [Locale]. We then select the Source text or string we want to translate and provide its translation in the screen’s lower box. After we click the Save button our PO and MO files for the respective locale will be updated, and our translation will appear on our site where we expect it. Note » Since we’re authoring the theme, we can safely ignore the notice on the the translation screen about our files being overridden. This warning applies to the case of us saving our PO and MO files in someone else’s theme or plugin. In that case our own locale files could get overridden when we update the respective theme or plugin if it has its own translation files. In order for WordPress to pick up our translation files, we must load them in. This step is easy to forget and we won’t see any translated text if we don’t do it. We just need to add the following line in our functions.php file. This function will load the MO file (if it finds it) of the current/active locale, e.g. if Arabic is the active locale it will try to load an ar.mo file for our theme. We now have a handle on the WordPress gettext translation process. Let’s dive deeper into the PHP functions that WordPress provides to tap into its gettext system. We use these functions regularly to internationalize our theme templates. Let’s reexamine the __() function. What the above code will do is look for a string in the current locale with the key 'Created by'. If the current locale was French, for example, we may have a translation of 'Created by' that reads 'Créé par'. If __() finds that translation, it will return it. Otherwise, it will return the string we fed it, 'Created by', as a fallback. What about the second parameter to functions like esc_html_e() and __()? In the above examples, we passed in the value 'handmadestale' for that param. This is known as the text domain, and we can think of it as a namespace of our translatable strings. There may be more than one instance of a string that is registered in different parts of our website. For example, 'Date posted' could be registered both in a third-party plugin and in our own theme. To differentiate between the two we use a text domain. Using a text domain also comes in handy when we translate, as we can isolate our own theme’s strings for translation, for example. And while the text domain parameter is optional in WordPress’ localization functions—if we omit it a default text domain is used—it is probably best to always provide a text domain param. The default domain is reserved for WordPress core. Let’s run down the available WordPress localization functions at the time of writing. Important Do not pass in variables for the $text or $domain parameters in WordPress i18n functions. The gettext system that generates translation files will analyze your files statically, not at runtime. So it will look for literal strings, e.g. __('Hello world', 'myawesomedomain'). The following just won’t work: __($foo, $bar). Note » You may know that the __() function is an alias for the translate() function. However, do not use translate() directly in your code because translate() won’t be picked up during gettext analysis and translation file generation. Note » The e functions basically do the same thing as their non-e equivalents, except that they echo the result instead of returning it. Note » You can peruse all the above functions on the official WordPress Codex. Note » You can get all of the code in this article from its companion Github repo. In the upcoming parts of this series, we’ll make use of these functions and explore the concept of context as it relates to WordPress gettext functions. You read about the context in the official WordPress docs, so we wanted you to know that we got you covered. We just can’t fit it all in one article is all. 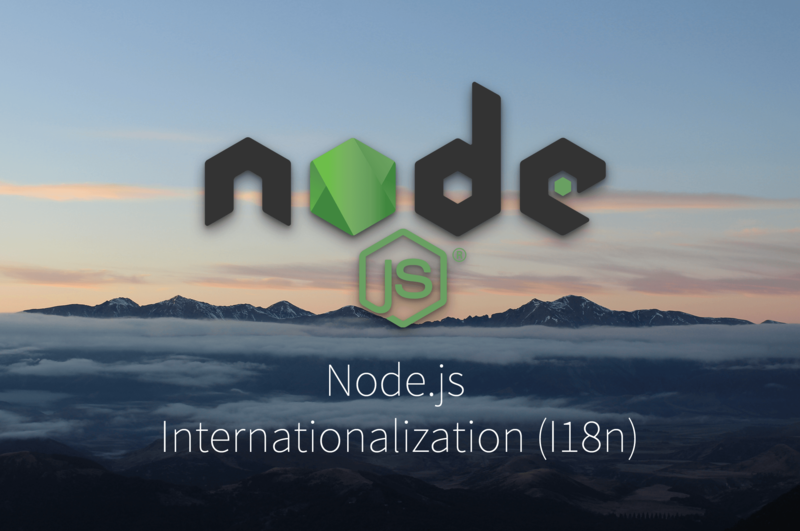 There is a lot of good information for localizing WordPress themes in the official document, I18n for WordPress Developers. It’s definitely recommended reading and has some good best practices. 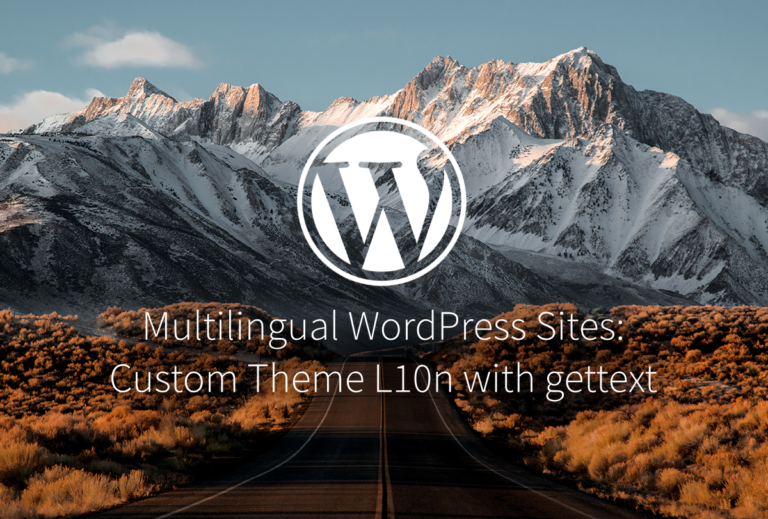 Armed with the knowledge of gettext and WordPress’ PHP i18n functions, you should be able to localize most of your WordPress theme’s templates. If you’re writing your own custom themes for WordPress, consider using PhraseApp to translate them. PhraseApp works with POT, PO, and MO files out of the box, and provides a pro feature set for i18n developers and translators. PhraseApp can sync to your Github repo to detect when locale files change. It also provides tools for searching for translation strings and proofreading your translations. PhraseApp even includes collaboration tools so that you can save time as you work with your translators. Check out PhraseApp’s full feature set, and try it for free for 14 days. You can sign up for a full subscription or cancel at any time. Published on January 30th, 2019 by Mohammad. Last updated at February 13th, 2019 .